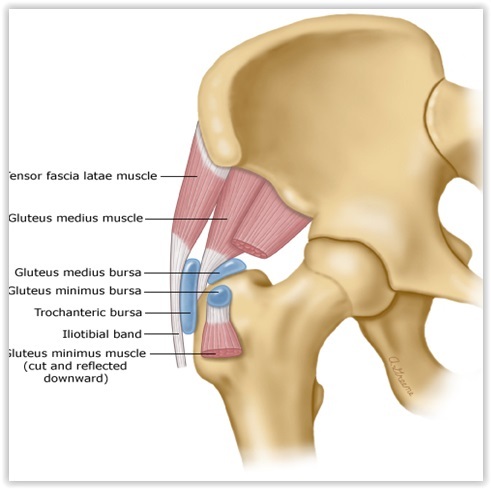 The pain involved in GTPS may be due to inflammation of one of the gluteal bursa or a tendinopathy of the gluteus medius or minimus muscles. Tendinopathy is a general term for tendon injury, which, initially involves inflammation and then progresses to breakdown, degeneration & weakening of the involved tendon. 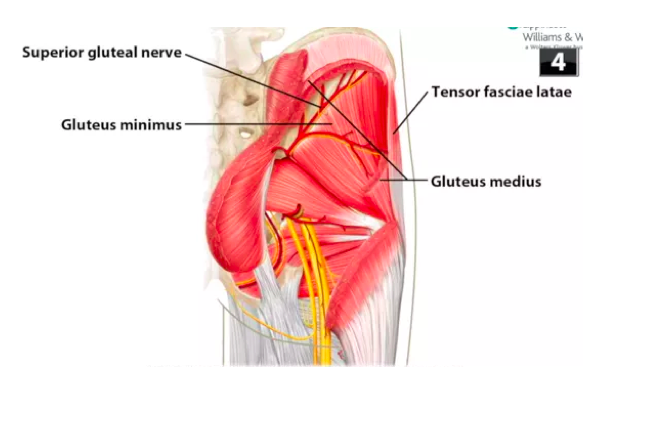 Currently gluteus medius or minimus tendinopathy is accepted as the most common pathology in GTPS. The greater trochanter is a bony prominence on the femur (thigh bone). 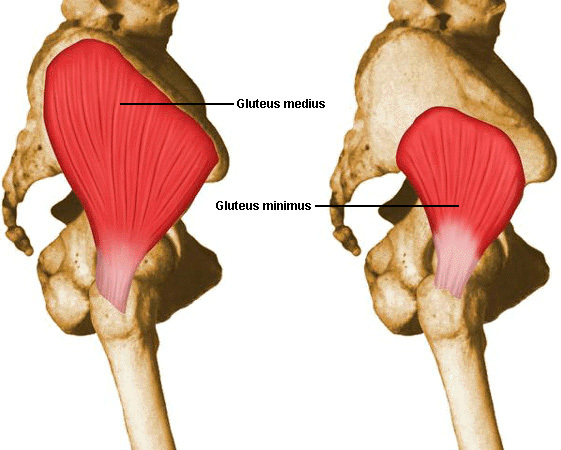 The gluteus medius and minimus muscles attach to the greater trochanter and sit on the outside of the hip. A direct blow to the outside of the hip. A fall onto outside of the hip. It has been proposed that abnormal hip biomechanics may predispose individuals to gluteal tendinopathy. It has been suggested that when the hip moves into adduction (inwards) there is increased compression and impingement of the gluteal tendons & bursa against the greater trochanter of the femur. Increased hip adduction may occur during upright weight bearing postures, like walking, running and stair climbing due to weakness in the hip abductor muscles . These muscles help to stabilize the pelvis and prevent excessive side-to-side movement (lateral pelvic tilt). Pain on the outside of the hip, which may extend down the outside of the thigh. Numbness in the upper thigh (less common). Snapping sensation near the outside of the hip. Avoiding positions that increase compression on the affected tissues. If the bursa or gluteal tendons are inflamed the first phase of treatment will focus on reducing inflammation and calming acute pain. Treatment during this phase may include: education, advice, laser therapy and very specific light exercises. Once acute inflammation has calmed down it’s important to improve function of the lower back, hip and knee joints along with the muscles and fascia surrounding these areas. This can be achieved with manipulation, mobilization, stretching and myofascial release therapy. A strengthening program to improve strength, power and endurance will also be critical in order for full healing to take place. Avoid stretching the IT band. Avoid standing with the hip dropped. Avoid lying on the affected hip. Lay on your opposite hip with a pillow between the knees or on your back with a pillow under both knees. Avoid sitting with the legs crossed. Avoid foam rolling or rolling a tennis ball over the painful area. It has been reported that up to 35% of patients suffering from lateral hip pain also have past or concurrent lower back pain. The relationship between these 2 conditions may relate to gluteal dysfunction associated with back or sacroiliac joint pain, or increased stress through the back as a result of poor stability of the pelvis. The nerves that branch from the lower lumbar spine also supply the gluteal muscles involved in greater trochanteric pain syndrome. The picture below shows some of the nerves that branch from the lower lumbar spine and pelvis. At the L4, L5 and SI levels of the spine nerves branch from the spinal cord and join to form the superior gluteal nerve . This nerve supplies the gluteus medius and minimus muscles, which are shown in the picture. When the lower back is inflamed this can cause the nerves of the spine to become irritated and dysfunctional. The irritated nerves may then send signals into the gluteal muscles causing them become tight and or sore. Similarly, if the gluteal muscles and tendons become weak, tight or inflamed there will be increased stress placed on the structures in the lower back (joints, ligaments & muscles). The chiropractors at Mountain Health & Performance see a large proportion of low back pain with concurrent hip dysfunction and hip pain with concurrent lumbar spine dysfunction. Lumbar spine and pelvis manipulation not only improves the function of the joints and tissues in the spine but can also help to decrease nerve signals, which may be driving hypersensitivity and tension into the gluteal muscles. Reduced mobility of the lumbar spine, hip joint, knees and ankles can also lead to altered lower limb biomechanics and contribute to injuries around the hip. Mobilization is a manual therapy utilized by chiropractors to assist individuals in improving movement restriction, pain with movement and functional restrictions. Acute injury or repetitive strain can lead to soft tissue adhesions and fibrosis that in turn causes chronic dysfunction and painful tissue injuries. During myofascial release techniques like ART and FR, the chiropractor will apply tension with his or her hands to the affected tissue. The tissue is then moved through ranges of motion that feel stiff, tight or reduced. With multiple treatments myofascial release helps to realign these adhesions, which improves tissue health, mobility and function. This can help reduce excessive loads on the tendons or bursa involved in gluteal tendinopathy and bursitis. The goal of rehabilitation is to decrease further injury to the structures around the greater trochanter region of the hip (muscles, tendon, bursa). It is also to decrease inflammation if it is present and to regain range of motion and strength. This may vary from person to person, but commonly rehabilitation will focus on; strengthening the gluteus medius muscle and tendon, strengthening the lower back and trunk muscles and improving mobility of the hip joint and surrounding muscles. If there is a gluteus medius tendinopathy present it is important to reload and strengthen this muscle and tendon. Isometrically loading the gluteus medius muscle in a pain-free range of motion with hip abduction exercises is a great way to stimulate healing for the tendon in the early stages of rehabilitation. Concentric and eccentric gluteal exercises may be prescribed later on in order to heal the tendon and help with dynamic pelvic stability. These types of exercise has been proven useful for healing in other types of tendon injuries including Achilles tendonitis and patellar (knee tendonitis). Once acute inflammation has been resolved a comprehensive strength based program is necessary for healing from all types of tnedon injuries.